October is still on course to be an exceptionally dry month as it comes to an end with little rain to speak of. With winter on the horizon, the talk (if you can call it that) has already started of “120 days of snow.” etc., etc. There are signs that this winter has a much better chance of being colder-than-average and hence increase the chance of snow, but as always, things can change. If you would like more detail and not an over-the-top complex view of what our winter set-up could be like, then read my friend’s article, http://www.chorleyweather.com/weak-polar-vortex-could-bring-an-early-uk-winter/. Currently, we have low pressure to our northwest and high pressure to our south, with us sandwiched in between. We now have a westerly flow so we are milder than recently. Next Week: Not guaranteed but it’s looking more and more likely that winds will turn to come from a colder northerly or northwesterly direction as the week progresses. This will bring sunny spells, the odd shower and daytime temperatures in single-figures as well as possible frosty nights. Our weather is always changing so keep up to date by following @ChadWeather on Twitter. I had a feeling the second half of October would be “rain-fuelled”. 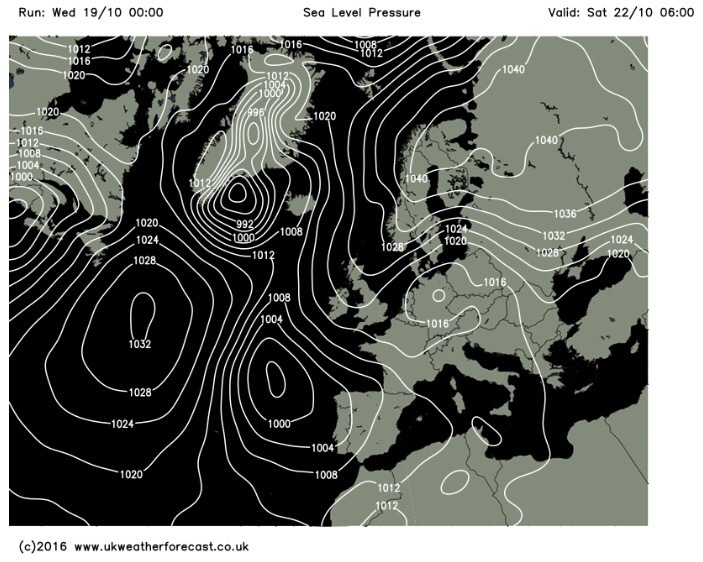 After a few days of rain you would think the same, but another blocking high pressure is set to dominate our weather which could give some overnight mist or fog as well as localised pockets of frost. Next Week: Low pressure to our southwest and high pressure to our northeast or east means we continue to be dry <October is turning out to be very dry indeed> and under the influence of a cool easterly airflow. As always, follow @ChadWeather on Twitter for the very latest forecasts. We’ve been under the influence of a huge area of high pressure based over Scandinavia for a good while now but finally things are about to change. If only we had had this set-up in winter. We can’t complain about our weather so far in October. It’s slowly become cooler but we’ve hardly had any rain; only 1mm in fact. Next Week: Low pressure in charge so spells of rain but some brighter, drier interludes too. Temperatures close to average. I would expect the remainder of October to be rain-fuelled after the exceptionally dry start, but as always, long-range is anyone’s guess. It’s been a decent start to autumn with most of us enjoying settled conditions and plenty of dry weather. This pattern is set to continue as high pressure to our northeast, acts as a block, stopping rain-bearing weather fronts coming in from the west. 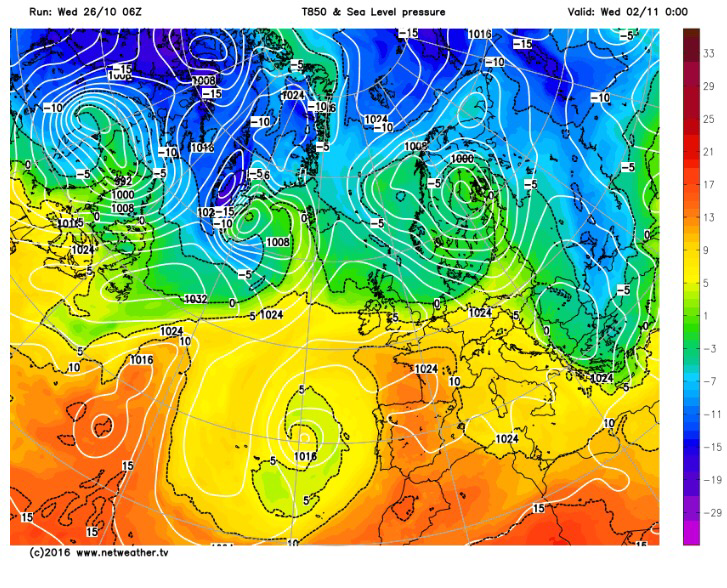 High pressure to our NE introducing blocking leading to cool easterlies. Thursday: Cool south-easterly winds across the region but it should remain dry with some bright spells. Max 13’C. Friday: Not much change, plenty of cloud morning and night. Some bright spells will try to break through during the day. Still a cool breeze. Just a risk of some drizzle, early and late. Cool. Max 13’C. Starting to feel like déjà vu. The weekend sees a lot of dry weather as the high pressure to the northeast stays put. Overall both days cool or even chilly in the breeze. Some welcome bright spells at times but these will come and go. See the sun and it will make it feel pleasant as long as you’re sheltered from the breeze. Max 13’C. Next week: Little change until later in the week, when the Atlantic, disturbed by the recent events of Hurricane Matthew, might start to kick back into gear again. However, with this high pressure very stubborn to move, our dry settled cool weather could continue. For sure though, the first half of October looks set to be very dry.